Photos of some of the authors -- From Left to Right: (top row) Nobuyuki Takei, Christian Sommer, Claudiu Genes, Guido Pupillo; (bottom row) Hisashi Chiba, Matthias Weidemüller, Kenji Ohmori. 8CAS Center for Excellence and Synergetic Innovation Center in Quantum Information and Quantum Physics, University of Science and Technology of China, Hefei, China. The dynamics of interactions among large numbers of electrons govern a variety of important physical and chemical phenomena such as superconductivity, magnetism, and chemical reactions. An ensemble of many particles thus interacting with each other is referred to as a “strongly correlated system”. Understanding quantum mechanical behavior of a strongly correlated system is thus one of the central goals of modern sciences. It is extremely difficult, however, to predict theoretically the properties of a strongly correlated system even using the Japanese post-K supercomputer, which is expected to be one of the world’s fastest supercomputers planned to be completed by the year 2020. For example, the post-K cannot calculate even the ground-state energy by exact diagonalization, when the number of particles in the system is more than 30. It is in general more demanding to calculate the dynamics of the strongly correlated system. Instead of calculating with a classical computer such as the post-K, an alternative concept has been proposed by Richard Feynman in 1980’s  and is now referred to as a “quantum simulator”, in which quantum mechanical particles such as atoms are assembled into an artificial strongly correlated system, whose properties are known and controllable [2,3]. It is then used to simulate and understand the properties of another strongly correlated system whose properties are not known. A quantum simulator could quickly simulate quantum mechanical behavior of a large number of particles that cannot be handled even by the post-K supercomputer, expected to become a next-generation simulation platform. We have developed a completely new quantum simulator that can simulate the quantum mechanical dynamics of a strongly correlated system of more than 40 atoms within one nanosecond [4-6]. This has been realized by introducing a novel approach in which an ultrashort laser pulse whose pulse width is only 10 picoseconds is employed to control a high-density ensemble of atoms cooled to temperatures close to absolute zero. Furthermore we have succeeded in simulating the motion of electrons of this strongly correlated system that is modulated by changing the strength of interactions among many atoms in the ensemble. In order to generate a strongly correlated system in which a large number of particles interact simultaneously with each other, it should be effective to assemble a quantum simulator with particles whose forces could reach as far as possible. A “Rydberg atom” is expected as the most promising candidate for that [7,8]. An atom usually has a diameter of about sub-nanometer, but can be irradiated with laser light to bring an electron that moves near its atom core to a high-energy orbital called a “Rydberg orbital”, whose diameter could be more than hundreds of nanometers. The atom thus generated is referred to as a Rydberg atom. Due to its long distance between the atom core with a positive charge and the Rydberg electron with a negative charge, a Rydberg atom generates an electric field that reaches a long distance. If one could build up an ensemble of Rydberg atoms, it should become a strongly correlated system in which those many Rydberg atoms interact simultaneously with each other. However, the strong electric field induced by a Rydberg atom shifts the energies of the Rydberg orbitals of its surrounding atoms as shown schematically in Fig. 1, so that conventional laser light cannot bring electrons of those surrounding atoms to their Rydberg orbitals. Accordingly there can be only one Rydberg atom within a sphere of a certain radius. This phenomenon is referred to as “Rydberg blockade” [7,8] and needs to be circumvented to generate a strongly correlated system of Rydberg atoms. Moreover there is another problem to be solved to realize such a Rydberg quantum simulator. Even if one could generate a strongly correlated system, the strong interaction among the Rydberg atoms would induce the temporal evolution of their quantum states on the timescale of 100 picoseconds, which is faster by a factor of more than hundred thousand than the timescale of a quantum simulator that has so far been considered. In order to create a Rydberg quantum simulator that can simulate a strongly correlated system, therefore, a totally new concept and technique have been needed to solve those two essential problems: (1) how to circumvent Rydberg blockade? ; (2) how to observe the system on the timescale faster by a factor of hundred thousand than the one considered for a quantum simulator so far? We have succeeded in solving those two essential problems for the first time. Figure 2a schematically shows a property of laser light that has so far been used typically for the development of a quantum simulator. It shines continuously as shown in Fig. 2(a-1) and is produced by a so-called “continuous wave laser”. This laser light has an extremely narrow range of wavelength (energy) as shown in Fig. 2(a-2). Therefore it cannot bring an electron to the Rydberg orbital that is shifted energetically in the surrounding atom as shown in Fig. 1. Instead of using this continuous wave laser, therefore, we has introduced a pulsed laser light that shines only during ~ 10 picoseconds as shown in Fig. 2(b-1). 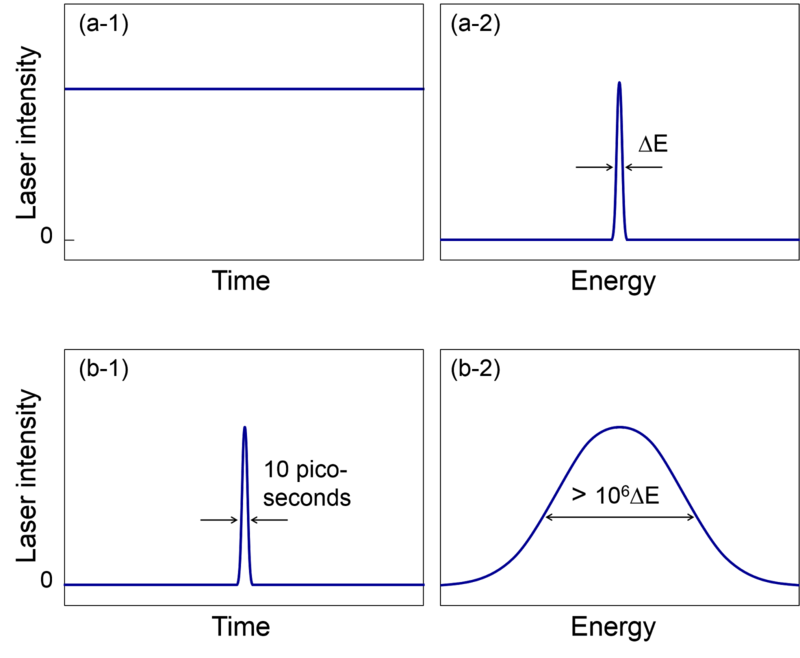 This pulsed laser light has its wavelength range broader than that of the continuous wave laser by a factor of more than one million as shown in Fig. 2(b-2). It can therefore bring an electron to the Rydberg orbital even if its energy is shifted in the surrounding atom. 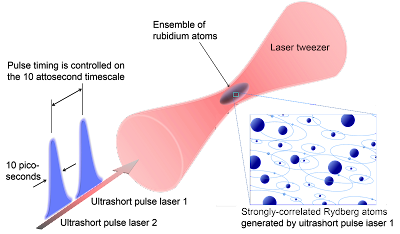 Moreover the temporal width of the laser pulse is one tenth of the timescale expected for the temporal evolution of the system, so that the evolution should be able to be observed in real time. Figure 2: Properties of conventional laser light that has so far been used for the development of a quantum simulator (a-1, a-2) and of the one newly introduced in our work (b-1, b-2). The experiment was performed with rubidium atoms. Figure 3 shows a schematic of the experiment. An ensemble of ~ 106 rubidium atoms was cooled down to an ultralow temperature around 70 microK with laser cooling techniques and trapped in a laser tweezer. These atoms were irradiated with an “ultrashort laser pulse 1” whose pulse width was ~ 10 picoseconds, and its wavelength range was appropriately manipulated with a special technique. The temporal evolution of the atoms after laser pulse 1 was observed with another “ultrashort laser pulse 2”. 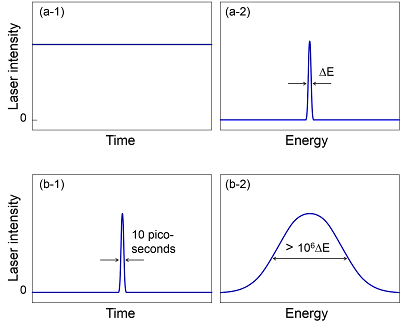 The delay of laser pulse 2 from laser pulse 1 was controlled ultra-precisely on the 10 attosecond timescale with a special device, so that the evolution was observed on this timescale. 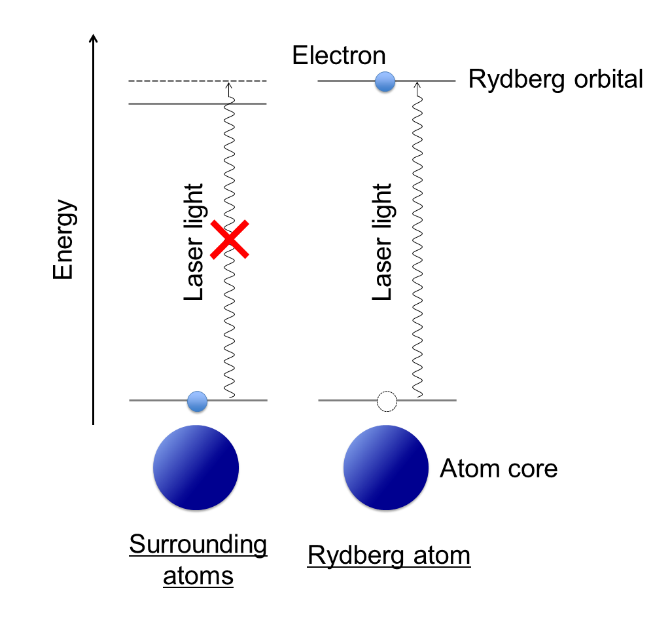 It was then observed in real time that the electrons of many Rydberg atoms, which were generated with laser pulse 1 that circumvented Rydberg blockade, oscillated with a period of one femtosecond, and the timing of those oscillations was gradually shifted on the timescale of 10 attoseconds due to the simultaneous interactions among more than 40 Rydberg atoms. Furthermore this timing shift has successfully been accelerated by enlarging the Rydberg orbitals or by decreasing the distances among Rydberg atoms to increase the strength of the interactions. Figure 3: Schematic of the experimental setup. We have thus introduced ultrashort laser pulses into a quantum simulator for the first time and succeeded in developing a totally new quantum simulator. This ultrafast quantum simulator can simulate the dynamics of a large number of particles interacting with each other that cannot be handled by even a world’s fastest supercomputer such as the post-K. The simulation has been completed in 1 nanosecond. It has been demonstrated that our ultrafast quantum simulator can quickly simulate the dynamics of a strongly correlated system of a large number of particles interacting with each other, which cannot be handled by even the post-K supercomputer. The ultrafast quantum simulator is expected to develop into a future simulation platform that could contribute to designing superconducting and magnetic materials and drug molecules, whose functionalities are governed by strongly correlated electrons. It is also expected to serve as a fundamental tool to investigate the origins of physical properties of matter such as superconductivity and magnetism as well as the mechanism of a chemical reaction that proceeds in a complex environment such as a liquid. Richard P. Feynman, “Simulating physics with computers”, International Journal of Theoretical Physics 21, 467 (1982). Abstract. Immanuel Bloch, Jean Dalibard, Wilhelm Zwerger, “Many-body physics with ultracold gases”, Reviews of Modern Physics 80, 885 (2008). Abstract. I. M. Georgescu, S. Ashhab, Franco Nori, “Quantum simulation”, Reviews of Modern Physics 86, 153 (2014). Abstract. Nobuyuki Takei, Christian Sommer, Claudiu Genes, Guido Pupillo, Haruka Goto, Kuniaki Koyasu, Hisashi Chiba, Matthias Weidemüller, Kenji Ohmori, “Direct observation of ultrafast many-body electron dynamics in an ultracold Rydberg gas”, Nature Communications 7, 13449 (2016). Abstract. 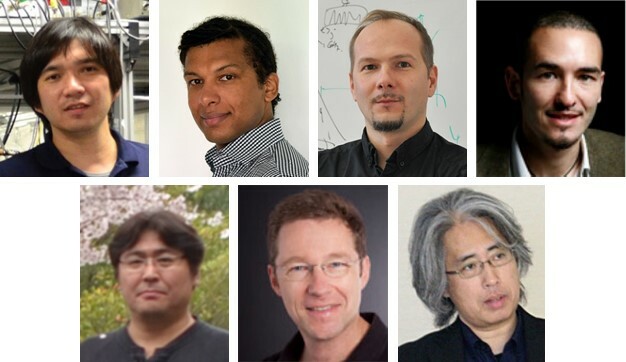 Christian Sommer, Guido Pupillo, Nobuyuki Takei, Shuntaro Takeda, Akira Tanaka, Kenji Ohmori, Claudiu Genes, “Time-domain Ramsey interferometry with interacting Rydberg atoms”, Physical Review A 94, 053607 (2016). Abstract. Kenji Ohmori, “Optically Engineered Quantum States in Ultrafast and Ultracold Systems”, Foundations of Physics, 44, 813 (2014). Abstract. M. Saffman, T. G. Walker, and K. Mølmer, “Quantum information with Rydberg atoms”, Reviews of Modern Physics, 82, 2313 (2010). Abstract. Daniel Comparat, Pierre Pillet, “Dipole blockade in a cold Rydberg atomic sample”, Journal of the Optical Society of America, B 27, A208 (2010). Abstract.